October 11th, 2014 | Posted by Velda in ACUPRES.,MERIDIANS, REFLEX. How to Apply Thumb Pressure to Reflexology points: Press and hold the points with your thumb. Apply gentle pressure at first. 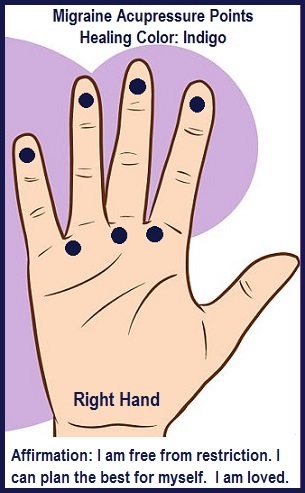 Advanced techniques are performed by applying small semi-circular movements, walking with your thumb along the reflexology points like taking small steps, or simply rubbing the thumb slightly up and down. Timing: Apply pressure to each point of the affected area for a minute or two and no longer. It is wise to release these energy blocks over a span of a few days or weeks. Always massage both feet. If the headache is caused by stress and tension, first try to relax by taking a warm bath and some deep breaths. After, apply pressure to the points on the inside area of the big toe and on the fleshy part on the center of the toe. Finally, apply pressure to the root of the big toe. For sinus headache: The fleshy centers of all the toes and the tips of the toes and outer edges of the big toe. Eye strain headache: The point between the second and third toe bones at the base of the toes. Also rub the root of the second and third toes. Headache from shoulder and neck tension: Apply pressure to the neck area and shoulder area. 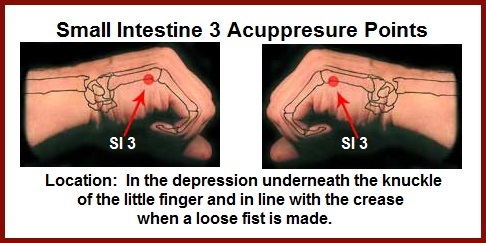 Find acupressure point SI 3 on the outer edge of BOTH hands just behind the knuckles of the little fingers. Follow acupressure directions below for pain relief to the neck, back, wrists, and fingers. Location: In the depression underneath the knuckle of the little finger and in line with the crease when a loose fist is made. Technique: Curl the fingers of one hand over the fingers of the opposite hand for support. locate the point using the nail of the index finger and apply acupressure angled inwards underneath the bone. 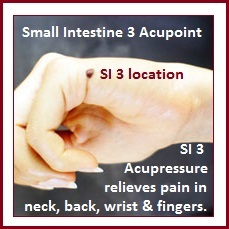 Apply steady, stationary pressure to SI 3 acupoint for 1-2 minutes. It is important to repeat technique on your other hand. Benefits: Reduces general aching in the body and relieves stiffness and pain in the neck, back, wrist, and fingers. Location: The sole of the right foot where the arch joins the heel, almost in line with the fourth toe. Conditions Aided: Processing & elimination of toxins, digestion, gallstones, irritability. Treatment: Use the heel of your hand to massage the right arch, begin in the center and work toward the outside of the foot. Next, rub the spot with your thumb, gradually increasing the pressure you apply. If sensitivity persists, finish by firmly pressing two knuckles to the area and hold for 30 seconds or until sensitivity decreases. Beneficial Essential Oils: Use essential oil or lotion that contains peppermint or rosemary essential oil to aid purification and digestion. Location: On the inside of the ankle, a thumb width below the tip of the ankle bone (shown above). 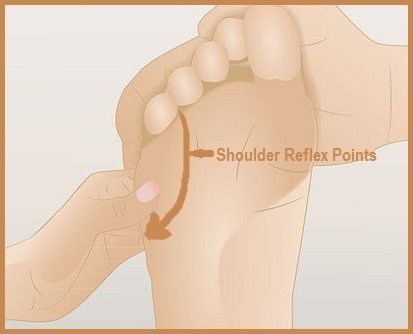 Technique: Place the fingers over the top of the ankle for support, apply acupressure perpendicularly with the thumb, then release, relax for several seconds and then repeat the sequence several times. Repeat on other foot. More Benefits: Kidney 6 is one of the go-to points on the Kidney channel for restoring balance with the Heart and alleviating emotional issues. 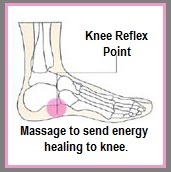 Knee Reflex Point: will help to strengthen your knee joint and send healing energy to any injured area. Location: found on the outside of the heal one inch below the ankle bone. It is located in a small and soft triangular section. Treatment: Place your thumb on this point and move it up and down with firm pressure for 5 minutes. If only one knee requires attention, massage the foot that is on the same side of the body as the affected knee. 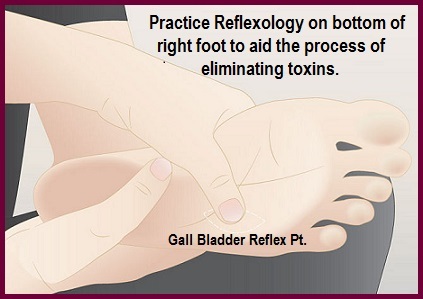 However, I recommend massaging the Reflex Points on both feet. You will feel relaxed and pain free after treating regularly. Beneficial Essential Oils: Massage oil or lotion that contains lavender essential oil will help ease pain. Benefits: 1. Helps to promote circulation and the flow of vital energy throughout the lower body. 2. Can improve mobility of the back and legs and relieve aching, pain, or stiffness in these areas. 3. Strengthens the joints of the lower back, hips and knees. 4. Relieves cramps and tension in the legs. Technique: Place the thumbs on the outside of each kneecap and the fingers behind the knees, while bending slightly. Use the middle or index fingers of each hand to located the hollow between the tendons at the back of the knee. Don’t press on the tendons and avoid varicose veins. Apply firm, even pressure for 30 seconds to 1 minute, breathing deeply and visualizing energy flowing freely throughout the lower body. Both points can be massaged simultaneously. If applying acupressure on someone else, sit in front of them, place your fingers round the back of the knees with the thumbs at the sides for support, apply pressure with the middle or index fingers, ask the person to deep breath and visualize as above. 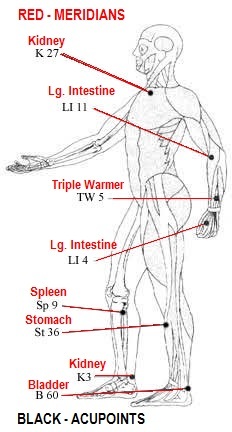 BOOST YOUR IMMUNE SYSTEM by using acupressure on the meridian acupoints shown on the left diagram. 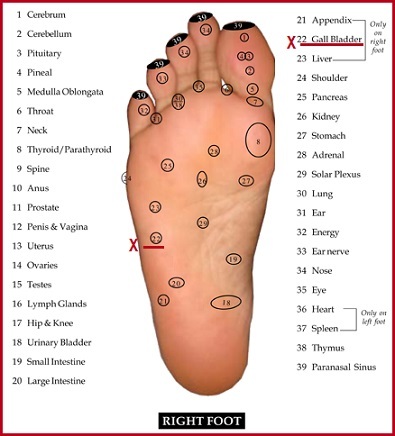 I have included location diagrams for all the acupoints below. Please don’t be overwhelmed. There is no need to work on all the acupoints the same day. Select the acupoints you want to work on with one or two fingers and rub in a circular motion clockwise or just press and hold with a firm pressure. If the points you are working on are sore, spend more time massaging. Remember to work the acupoints on each side of the body. K 27: Place your fingers in the depression above your breastbone. Move fingers out to each side and down 1”, just below the collar bone. You should feel a small soft spot. LI 11: On the side of the elbow, on the outer side of the arm. Bend your forearm. The point is located at the end of the crease at the elbow. This is halfway up the side of the arm. TW 5: Is 2-1/2 finger widths from the wrist crease, between the two bones of the forearm. LI 4: With the palm down, on the ‘V’ between the thumb and index finger. 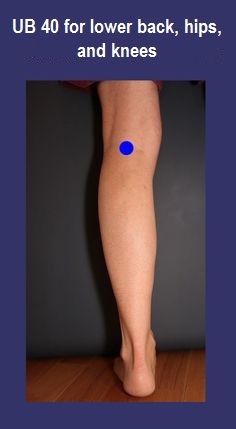 SP 9 : Located in the depression on the mid-line of inner leg. St 36: Located hand width below the kneecap, on the outside, in the depression between the shinbone and the leg muscle. 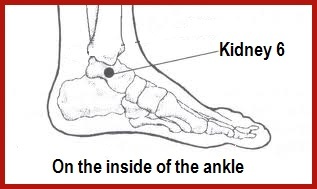 K 3: Located in depression behind the inner anklebone (big toe side of foot). 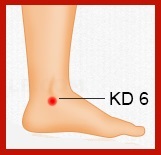 B 60: Located in the depression just behind the outer anklebone (pinky to side of foot). The Shoulder reflex points are between the pinky and fourth toes to the outside of the ball area of the feet. Massaging these areas relieve shoulder pain, stiffness, fatigue, and tension. Treatment: 1. 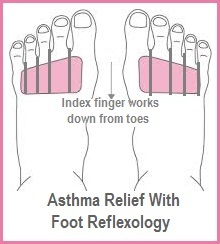 Begin massaging the area beneath the pinky toe with the heel of your working hand while the other hand supports the foot as shown in this illustration. 2. Next you can knead this area with harder pressure using the knuckles of the working hand. 3. Finish by rubbing an ARC from the toe to the outside of the ball of the foot with your thumb. If only one shoulder requires attention, massage the foot that is on the same side of the body as the affected shoulder. 4. The shoulder reflex points on the hands correspond in the same position as the feet. 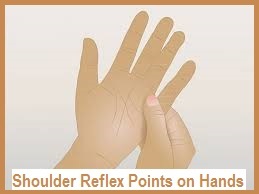 You can massage these reflex points with the thumb for shoulder pain relief throughout the day. Also to enhance massage results, author Skye Alexander of the Reflexology Card Deck recommends using a massage oil or lotion that contains essential oil of sandalwood or frankincense to ease tension.